We're up early and on line today at both the Herald Square and flagship stores for the much anticipated Comme des Garçons for H&Mlaunch. Brace for pushing, shoving, long lines and lots of polka dots. And if you're waiting with us, you can track our Twitter and tag your own updates with #rny. 7:36am: Just arrived at the Herald Square store. Line about 40 deep. Teens studying for an anatomy test in front of me. 7:47am: Line now around the corner. 7:55am: So the line is not all kids. There's a guy in a funky, chunky sweater and some older groups behind me. 8:12am: Since we're in front of Victoria's Secret, people are talking about the news that VS bras may have formaldehyde. 8:28am: Passersby are starting to ask questions. Hate when that happens. 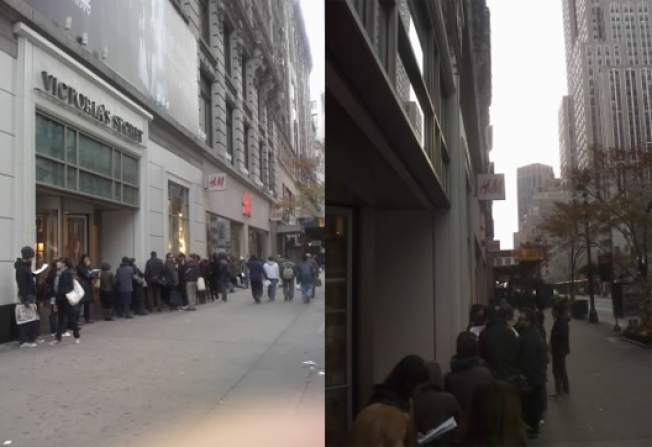 8:32am: H&M people just came down the line handing out cards about the item limit. One woman asked about sizing, employee says it runs very small. 9:06am: OMG in and it's all gone! 9:22am: Only cologne, trench and simpler dresses left. 9:25am: Never had a chance at the wallet and scarf and I wasn't even that far back in line! 9:30am: Now just hanging out, hoping.